My first thought it that this is a sticky holiday. What about kids that don’t have moms? Celebrating the day could make an awkward or sad situation for them (and you). However, my second thought was that it’s important to help our clients appreciate their mom, and what a special role we could play in helping their moms feel appreciated, which I’m sure doesn’t happen much. Or instead of celebrating Mother’s Day and Father’s Day, pick a week for Parents Week. Below are my favorite ideas I adapted from activities I found online. Choose a simple sentence for the card such as “Thank You Mom” or “I Love You Mom” and put the words on individual pieces of paper (to eventually all fit on the card). This can be adapted for non-verbal clients by using symbol pictures (for an example I love see SpeechLanguagePirate’s post, scroll way down). Do an activity in which the rider collects the papers and attached them to a card or paper sheet for their mom (use glue or tape). Papers can be collected by a) ride to stations, perform skill at each station, get 1 picture in return; b) hide around arena and go find them; c) use one station in an obstacle course to be the place the pictures are collected, 1 each round. 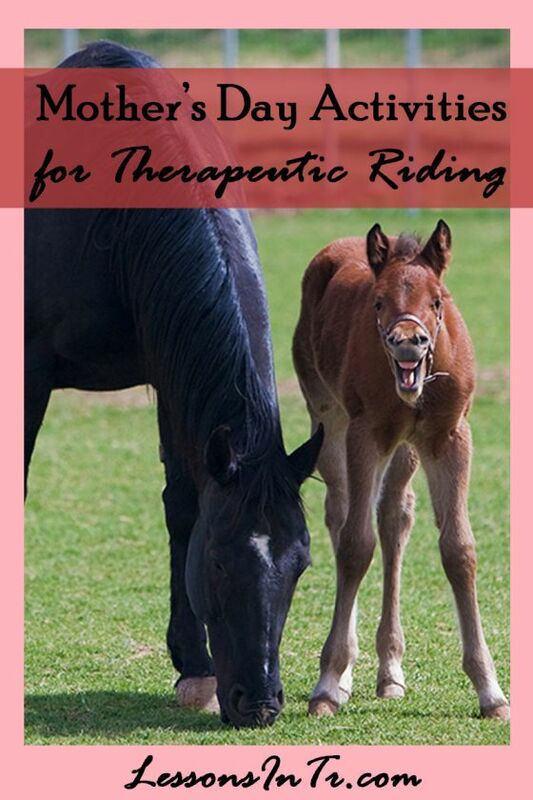 Create a bookmark using 3-4 components – for example: the bookmark rectangle, a square that says “I Love You Mom”, and a photo of the rider with their horse. Collect the pieces and make the bookmark (with glue or tape). Pieces can be collected in the ideas mentioned in the card activity above. Find pictures of baby animals and their parents, and create matching cards. Use the cards in a matching game in one of the ways mentioned on the matching games blog post. At the end discuss what the moms are doing for their babies, and how their babies can thank them. I like this game because it’s not as personal as the others for clients who do not have mothers, it can be easily changed to talk about any parent or someone who helps you or about types of animals. Find pictures of a mom doing daily activities such as driving, cooking, hugging, playing, etc. and make 2 cards of each. Play a matching game (again, in one of the ways mentioned on the matching games blog post). Discuss everything mom does for us, what else does mom do, and how to thank her. Perhaps have them each pick one of the daily activities to thank their mom for doing. Set up a few activities or obstacles in the arena. Discuss with the riders how to politely ask their mom if they can do something by asking, “Mother, may I…?” and how moms respond yes, no, or by giving an alternative based on what they think is best for their child at the time. The Instructor starts as Mother and the riders are all Children. The Children take turns asking “Mother, may I…?” filling in the blank with an activity from the arena (walk on the rail, walk over a pole, trot, etc.) and the Mother can answer, “Yes, you may,” or “No, you may not” (and give a reason), or “No, you may not, but you may…” and give an alternative. Then the rider performs the task to practice their riding skill. You can continue the game in two ways: 1) you (instructor) stay Mother and continue to tell them what is safe to do. The goal is not to win in any way, but to practice their riding skills and perhaps get to do a preferred activity (like the basketball). 2) you (instructor) stay Mother and the goal is for the Children to reach their mother. You stand at one end of the arena and the Children start at the other end. If a child forgets to say “Mother, may I?” they must return to the starting line. 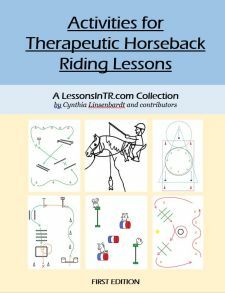 The Children ask the instructor, “Mother, may I?” and the instructor answers with a riding skill. 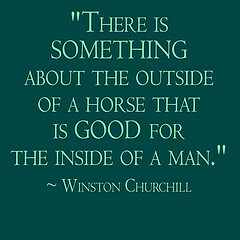 All the riders perform the skill. Then the instructor chooses a rider to be the new Mother. The Children ask the new Mother, “Mother, may I?” who answers with a skill of something they normally practice, or an obstacle in the arena, or perhaps draw a card of what they get to do. Mother rider is the first to lead everyone else through the skill. Mother rider then picks a new Mother. Note: this activity may prove difficult to keep the riders moving, which is usually desired because it gives the most benefit to the rider and time to practice skills, so make sure to keep them moving somehow instead of just standing around. Prepare the activity by having volunteers cut out tons of pictures of things from magazines (eventually to be used to describe mom, but don’t limit your thing!). Place the pictures on stations around the arena that also have a riding skill task to practice – I’d say 3-4 stations. At each stations the rider first completes the riding skill task, and when they accomplish it, get to choose a picture from the pile of something that reminds them of their mom (or represents something they love about their mom, etc.). They glue their pictures on a card or paper for mom that says on front “What I love about mom…” – they can glue them all at once at the end of the lesson, or one at a time at each station, or finish the project after they dismount with their volunteer helping. Help them give it to mom and explain to her what it means and why they chose those pictures. Succulents are so cute and peaceful, I would think a mom would love to receive one! This craft is simple and from the LittleBitFunky blog (go see her post for pics). She says each one cost her $2, so maybe it’s cheap too. I love my Mommy, she’s the best. My Mommy is a great one. Here are some other ideas I had but didn’t detail for you because I liked the others better. But maybe you’ll find some inspiration in these! Include mom – have her participate in the lesson/game this week! Mom Portrait – Make a picture of your mom! Provide construction paper face shapes of different colors, hair shapes of different cuts and colors, eyes of different colors, and noses and mouths. Have the students pick the pieces that best represent their mom and glue them together. Discuss what their mom looks like, how are they like their moms, how are they different, etc. 5 things I love about mom card – Use printouts like the one here (scroll down) that has 5 lines to write what you love about mom.. Help the rider write what they love, or choose an image that represents it. Give it to mom. Give parents coupons from local businesses – or include them in the card their child makes during their lesson! Do you celebrate Mother’s Day with your riders? If so, what activities have you done?